Ho Ho HO! Here's something to put a little joy in your stocking! 3 great Lauscha greens and two exceptional reds! 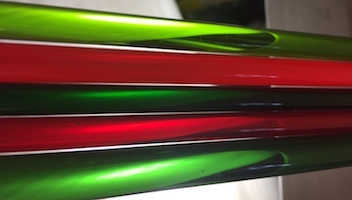 You'll get one rod each of Moss Green, Emerald Green and Dark Transparent Green plus translucent Strawberry and transparent SNT 219. All holiday favorites! Looking for a nice selection of BROWNS, earthy and delicious? This Lauscha Mini-Pack includes one rod each of Dark Maple Transparent, Chocolate Kiss, Tri-Color Amber & White, Champagne Mocha, and Cocoa. Play and have fun! Rods are COE 104 Compatible. 13" long. Hand pulled in Lauscha, Germany. I Can See Clearly Now is a new Lauscha Mini-Pack of near-clear delicious tints! 1 rod each of 10 different tints. You get Lauscha Clear, Soft Clear, Lavender, Light Fuchsia, Ice Blue, Thuringen Herb, Light Thuringen Herb, Citron, Seashell Pink and Champagne. Just gorgeous! Rods are COE 104 compatible, 13'' long and hand pulled in Lauscha, Germany. Get yours today! Got the blues? Get 'em! Lauscha Blues, that is! In this new Mini-Pack you get 7 blues to play with! One rod each of Wedgwood Opaque, Aquamarine Transparent, Cornflower Transparent, Stardust Blue Opaque, Blutonium reactive Transparent (that's the one with the terra cotta tip, which you get with a reducing flame), Steel Blue Opaque and Dark Cobalt Opaque. COE 104 Compatible. 13" rods. Hand pulled in Lauscha, Germany. You'll enjoy this harvest of scrumptious colors from Lauscha. Assortment includes a variety of Fall colors, and may include Butternut, Brick Red, Lemony Snickett, Amber, Chocolate Kiss, Sunshine Yellow, Goldenrod, Strawberry, Creamsicle & Tri-Color Amber. 104 COE compatible. 13" rods. Mostly 6-8 mm, some 4-6 mm. Here's your chance to explore the legendary Lauscha "candy canes" without breaking the bank! They come in an exciting assortment of colors on a crystal base. Some even have a bit of goldstone running throughout the length of the cane! These are COE 104 compatible and come in 13" lengths. Most are 6-8 mm. 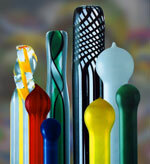 Great for pendants, and off-mandrel creations and sculptures. Our Lauscha Fun Pack gives you the most bang for your buck! You'll receive one pound of assorted rods. Brilliant transparents! Creamy, dense opaques! Plus a Candy Striped Rod! Test and explore! It's a great value! Great for beadmaking and sculpting. COE 104 Compatible. Find out why all the world loves Lauscha glass....You will, too! Now you can make glass pens that really write! This pen kit is an excellent value! You get five 13" Lauscha striped "candy cane" rods, a clear ribbed rod for pen "nibs" (tips), a solid colored rod, and a tutorial. All you need to supply is the ink! Glass is hand pulled in Germany and COE 104 compatible. NOTE: YOU make the pens! There are no finished pens included in this kit. Photo shows the work of Ralf Griener-Adam. The Lauscha Mini Pack is a great way to test drive some Lauscha rods without breaking the bank! You'll get one rod each of: Th�ringen Salmon Strawberry Blutonium Dark Amethyst Goldenrod Yellow Stardust Blue Tangerine Clear. 104 COE compatible. 13" rods. Test and explore....Lauscha is lovingly hand pulled in Germany. Resists boiling. Doesn't scum easily. Great for beads and sculpting! You'll love it! Now's your chance to explore a dazzling array of spectacular Lauscha purples and violets! Includes Dark Transparent Lavender, Light, Medium and Dark Amethyst, Transparent Purple and Dark Transparent Purple, Supernova and Opaque Violet. Rods are COE 104 Compatible & come in 13" lengths. Purple Packs are 1 lb. each and include a variety of diameters. The majority of the rods are 6-8 mm.